Isaac Roth was a diamond dealer, born in Liberty City and a member of the Jewish Mob together with friend and partner Mori Green. Roth had deals with Claude Wome for diamonds imported from Africa, one time leading to being arrested. Roth also had connections with Pegorino Family Capo Ray Boccino. He entered a deal with Ray, which took place in the The Libertonian. 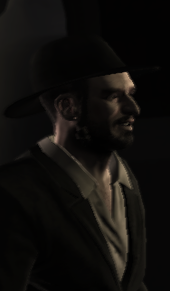 Isaac, Mori and two others stood face-to-face with the two men dealing for Ray, Johnny Klebitz and Niko Bellic. While Mori was looking at the diamonds, Luis Fernando Lopez shot Mori down while having his gun through a window. The men quickly fled, the diamonds being taken by Luis and the money being taken by Johnny. He thought it was set up by Ray and threatened to have him killed. Ray then sends Niko to kill Isaac at his temporary hideout spot, the Majestic Hotel. Isaac was executed by being shot through the chest. Affiliations: Linked to Italian American Organized Crime. Diamond dealer thought to be linked to various Organized Crime Syndicates. Arrested in connection to an operation importing illegal conflict diamonds from Africa. Works closely with Mori Green. This page was last modified on 26 October 2013, at 18:55.